In stock -This product will ship today if ordered within the next 2 hours and 2 minutes. 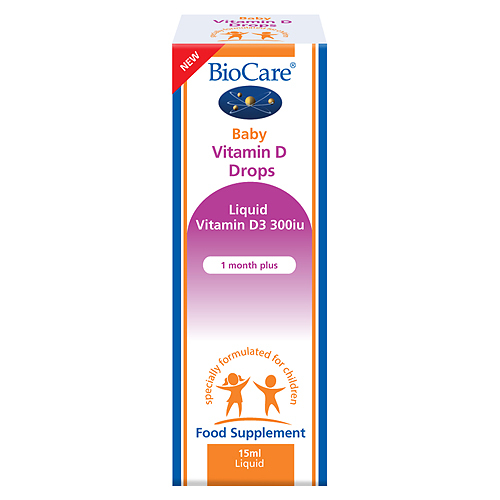 BioCare Baby Vitamin D Drops provides a vitamin D3 in a palatable, pure and simple olive oil base. It provides 300iu of vitamin D per daily intake. Ideal for babies and suitable from one month onwards. Pure and simple liquid base, free from additives and preservatives. The UK government recommends that all children from 6 months to 5 years take a daily supplement containing 7 to 8.5mcg of vitamin D.
Extra Virgin Olive Oil, Medium Chain Triglycerides, Vitamin D3 (as Cholecalciferol), Antioxidant (DL-Alpha Tocopherol). Three drops taken daily in water, juice or milk, with food, or as professionally directed. Shake well before use. Suitable from 1 month. 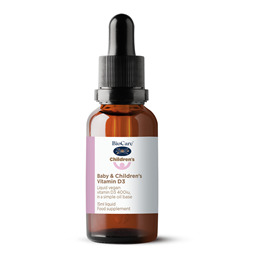 Below are reviews of Baby Vitamin D Drops - Liquid Vitamin D3 300iu - 15ml by bodykind customers. If you have tried this product we'd love to hear what you think so please leave a review.